We love traditions in our family. “Love Muffins” on Valentine’s Day, a new board game on the first day of school, pumpkin patch visits in the fall, sleeping under the Christmas tree the first night it’s up, and new pajamas from “Frosty” every winter. I sometimes giggle that my kids are so used to our traditions that they think they’re just a normal part of life. This year we’ve had the privilege of having another family live with us for several months. They’ve been here through a few of our birthday traditions and our first day of school traditions. 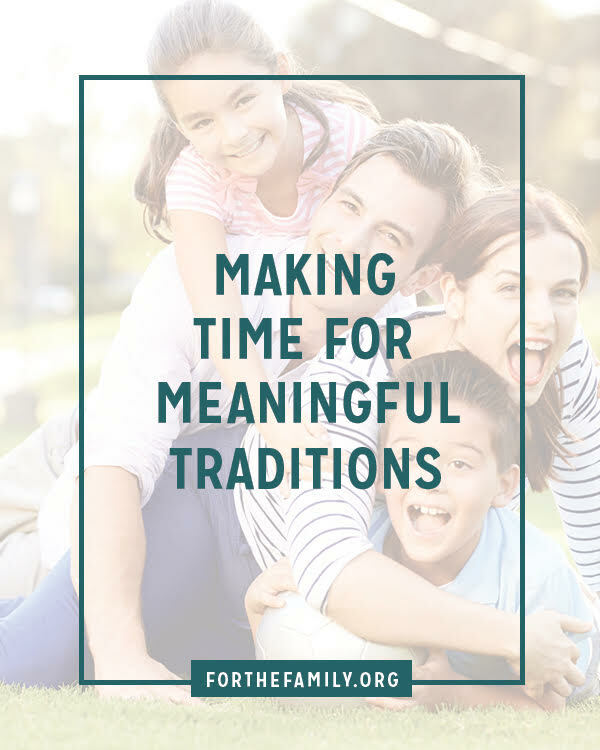 It’s been a bit of an eye opener for my kids to see that other families don’t do all the special things we do — and that they have their own fun traditions, too. Let’s just say I got some extra hugs from my kids at the start of our homeschool year when the other kids in our home remarked throughout the day that they’ve never celebrated their first day before. It’s easy for traditions to loss their meaning and sense of specialness through the years. There’s also the flip side of this, too. Keeping lots of traditions going year-to-year can become exhausting and overwhelming. I know I have quite a long list of fun things I want to do each Christmas. I believe traditions are an important part of bringing our family together and creating lifelong memories. I’ve actually been speaking on their value for over a decade. Whether you’re a family who just needs a few ideas for starting traditions in your home or you’re a family who needs a reminder that you don’t have to “do it all,” these tips will help you to make traditions fun and meaningful in your family. 1) Pick only a few for each celebration! It’s really easy to get overly excited about all the fun traditions that can be incorporated into your holiday celebrations, especially with seasons like Christmas. Focus on a few of your favorite traditions. You can always rotate them from year-to-year. I keep a little traditions list as a reference and a place to put new ideas. Don’t be afraid to switch your traditions to different holidays. As I mentioned, we have LOTS of fun traditions that we do around Christmas time. I’ve realized that it’s unrealistic to do them all, so I’ve moved some things around. Instead of a gingerbread house at Christmas time, we make a “Love” cottage around Valentine’s Day and decorate it with little hearts. I try to do my “holiday baking” at Easter time. Don’t be afraid to stop doing traditions that have no real significance to you or your kids. Sometimes we do things that take a lot of energy and have very little value other than we seem to do them over and over again each year. It’s a little crazy…and I’ve been guilty of it. Now, if there is deeper meaning to it, like pointing us to the Lord, then maybe tweak it a bit. Create some new traditions. I love hearing about other family’s traditions, and how other countries celebrate throughout the seasons, too. Again, I just keep adding to my traditions list throughout the year. It’s fun to look over it and pick what we’re going to do for the upcoming holidays. Basically: Keep it simple! Family togetherness is key! P.S. I have an entire chapter on adding fun to your family time in my free book, Sanity Savers for Moms. My traditions planner printable is in there, too. Please feel free to check it out HERE. I’ve also shared about a few of our fun traditions on my site. You can find a link to them HERE.